We assist customers in taking advantage of the economical square footage above their heads instead of pushing out their walls. Structural steel mezzanines are ideal for creating useable space above while leaving the space below available for production. They can be free standing, or building column connected. If there is an area that is occupied or needs to be occupied by shelving, but more space is needed, then a shelf supported mezzanine would be the best choice. Rack supported mezzanines are the perfect application when additional work space is needed, but the floor space is occupied by rack or needs to be occupied by rack. Work platforms are at times considered mezzanines. Work platforms are commonly used to elevate equipment such as conveyor, inplant offices, security cages, etc. 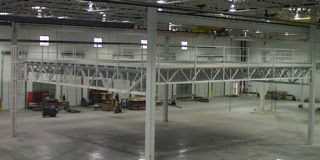 They are not always, but typically, smaller in size than structural steel mezzanines. Crossovers may be getting people safely over and across equipment, catwalks for maintenance access, or support for piping between processes or buildings. CSI is your logical choice for Mezzanines, structural mezzanines, rack supported mezzanines, shelving supported mezzanines, crossovers, and work platforms in Chicago, Illinois, Wisconsin, Indiana, the Mid-West states. We utilize a number of manufacturers who are exceptional: Steele Solutions, EGA Products, Speedrack, Steel King, and Hallowell. CSI has experience in applications involving structural steel mezzanines, shelf supported mezzanines, rack supported mezzanines, work platforms, crossovers. IF YOU DO NOT SEE SPECIFICALLY WHAT YOU ARE LOOKING FOR, Contact us We offer a wide variety of mezzanines, including column spacing, support structure, decking, bases, railing, custom designs, designs for specific purposes, seismic, and more. Our objective is to assist you in obtaining your goals and objectives.